The new MGI JETvarnish 3D Evolution has expandable sheet options up to 29×47″/75x120cm at 3,300 B2s per hour. The Scodix Ultra2 Pro with Foil – Multi Material Digital Enhancement Press – provides brilliant foil effects for a wide variety of substrates. Eye-catching metallic effects are among the latest beneficiaries of the digital post-print revolution. Digital inkjet technologies with raised varnishes and foils, as well as laminating processes (foil sleeking), are being used for a variety of specialty print applications. The usual digital benefits – easy artwork, no makeready, no waiting, economic short runs, one-offs or variable data from copy to copy – are joined with the ability to add metallic foil and dimensional varnishes through digital processes. “The last 20 years have marked the steady adoption of digital design, workflow and press equipment in the marketplace – with both toner and inkjet-based systems,” explained Jack Noonan, marketing manager at MGI-USA in Melbourne, Florida. “The next phase of this evolutionary process will be to extend the flexible benefits of digital technology to the last frontier of job completion: the realm of postpress finishing. Examples of digital enhancement include 2D flat spot varnish coats, 3D raised dimensional textures and embossed variable data foiling (VDF). “A beneficial result of these new developments will be a growing market awareness about new types of ‘sensory-based’ print applications designed to create a memorable impact in a world of omni-channel communications. The tactile and optical special effects represent a powerful new way to use print as an information medium,” Noonan added. 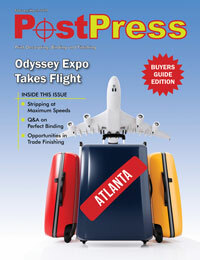 PostPress spoke with foil print production suppliers and business owners using the latest techniques to see how they are used and what the advantages are for various types of printed pieces. They also gave insight into how offering digital foil has helped them forge stronger connections with their customers. According to Noonan, MGI JETvarnish 3D presses produce 100% digital print enhancements with dramatic and dynamic 2D/3D foil highlights for applications on hundreds of substrate surfaces, including paper, plastic and synthetic stocks. MGI demonstrated the first digital 2D UV process at Drupa 2008 and the world’s first 3D UV and digital foil embossing system at Drupa 2012. At Drupa 2016, MGI expanded the JETvarnish 3D product series with capabilities from 12×18″ to B1+/full sheet (29×47″) and 16.5″ rolls. The Scodix Foil Station, available from Scodix Inc., Saddlebrook, New Jersey, is an optional module that runs inline with the company’s Scodix Ultra Pro digital enhancement press. It delivers foil capabilities such as high gloss, embossing and a variety of densities for short to medium runs, using a highly advanced, efficient digital process. Scodix Foil is ideal for coping with short to medium runs where long makeready and set-up times can be drastically decreased and tooling completely eliminated. It’s also highly suitable for converters and existing finishers offering foil for high-end short to medium runs. “Scodix Foil is designed for short to medium runs, particularly those where foil applications would previously be outsourced or require lengthy and costly makereadies,” said Lynn Kolevsohn, director of marketing. “Being a digital enhancement technology, Scodix Foil delivers what customers demand: brilliant foil effects, with no waste or mess. The application deploys a range of foils compatible with a wide variety of substrates including offset, digital, plastics, laminated or non-laminated and coated or uncoated. This enables us to deliver high-quality applications such as business and greeting cards, folders, book covers, brochures, labels, packaging, invitations and more. These higher-level projects include mailers for luxury cars, fine art commemorative posters, ticketing, high-end book and brochure covers, and premium small packaging, such as that used for cannabis. Variable data also lets DMS do ticketing, and the company is in beta testing to work with the National Football League on ticketing, where the variable data capability will make quick work of row and seat numbers. The dazzling effects are sometimes difficult to get across in pictures or descriptions. “It’s hard to express to prospects,” said Rula. “A picture doesn’t do justice to what the finished product will look like. Sometimes clients need a sample before they can appreciate the visual and tactile effect.” The MGI system allows DMS to print and embellish a complete sample proof at a reasonable cost. C&T Print Finishing, Inc., a family business in South Windsor, Connecticut, recently purchased an MGI JETvarnish 3DS with iFOIL press. According to principal Tracy Cole, this machine was obtained with the intention not to compete with the printers, but to embellish a printing company’s printed materials. Cole said the MGI system allows C&T to provide a less expensive way to achieve the desired foil effect, because the customer does not have to pay for a traditional hot stamping die. The press “prints” UV at 2D or 3D levels, and the foil adheres to the UV. In addition to the metallic foil effect, the customer also can achieve an embossed effect with raised 3D inkjet varnish capability. The spot 2D UV alone, applied to a printed piece, improves the appearance of the printed product immensely. In addition, this technology allows C&T to offer variable foil at a low cost. When the customer needs to see what the finished piece will look like, its easily accomplished. Having this type of proofing process on the MGI also allows C&T to provide a true foiled proof to the customer. The finished metallic foil may be accomplished through the JETvarnish or through a more traditional foil stamping method, depending on the type and length of the job. This ability actually can help bring in further work on traditional foil stamping equipment as well. According to Kolevsohn, localization is another incentive for brands to make smaller runs, as products are tailored from region to region. The process comes with a high level of complexity, which is managed easily through digital technology. While it’s important to ensure there is an element of “shelf/shout,” something that makes packaging and the product itself unique is also key. These factors also make it difficult for the brand to be copied, reducing the risk of counterfeit goods, according to Kolevsohn. SunDance Marketing Solutions, Orlando, Florida, utilizes its MGI process to lay down the polymer coating, then laminate the foil over the clear polymer. “SunDance has all the latest foiling equipment and technology in house to achieve optimal efficiency, while delivering a stunning final product at a price point our customers love,” explained Kandi Johansmeyer, senior VP of sales and marketing. SunDance offers an extensive color selection of foils, including holographic foils, custom foil colors, metallic foils, gloss or matte pigment foils and even refractive patterns that can be added to the stamp to produce an eye-catching 3D image range of options. “The growing success of service providers utilizing digital enhancement technology to embellish and decorate color ink output means that they can strengthen both their bottom line revenues and their customer relationships,” Noonan concluded.